I knew that I would fall in love with Bassett Street Brunch Club instantly. Serving brunch and comfort food all day long and late too. Below are photos of most of the food I've eaten off the Winter/Fall menu. They soon will be releasing their Spring menu. Their Facebook and Instagram are a good way to keep updated on specials and events. This coming Saturday, March 8th, from 8am to 3:30pm they're having a Luau-Themed Brunch. Tropical inspired food and drink specials. Spring break swag bag giveaways. Also wear tropical gear and get 15% off your check! Brunch Club Omelet - filled with sautéed zucchini, onions, roasted red peppers, prosciutto, and goat cheese. Served with breakfast potatoes. Bananas Foster French Toast - egg batter-dipped Challah bread, topped with bananas brown sugar rum sauce and pecans. Spring Break Diet - a bowl filled with black beans, brown rice, scrambled eggs, green onions, avocado, cilantro, roasted tomato ranchero salsa, queso fresco, and corn tortillas. The Token Burger - a 1/3 pound Knoche's Butcher Shop ground beef patty toped with lettuce, tomato, onion, sweet and sour pickles, and aioli on a toasted bun. Added a sunny side egg for an extra cost. 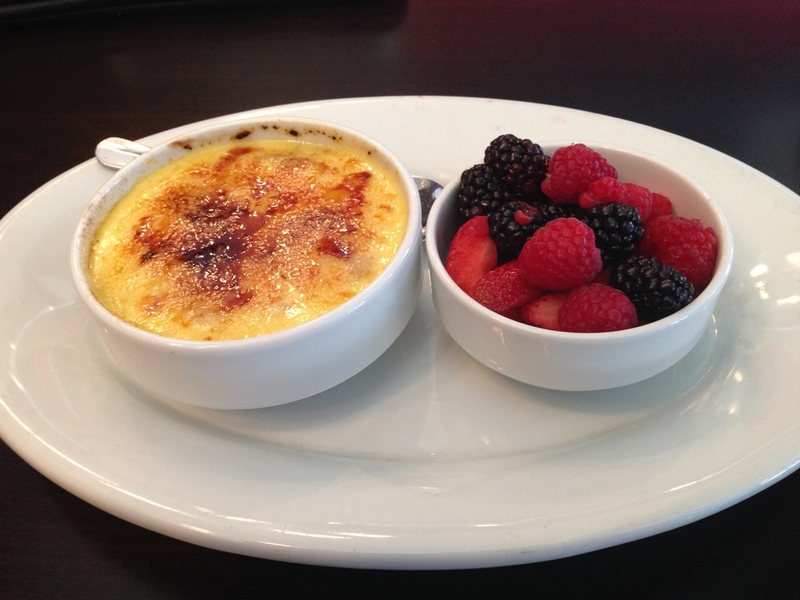 Oatmeal Creme Brûlée - a bowl of steel cut oats topped with vanilla custard and a bruleed sugar crust. Served with fresh berries. Fried Chicken & Donuts - old fashioned cake donut holes and crunchy fried chicken bites. Served with creamy honey sriracha and lemon peppercorn ranch. Bourbon Sweet Potato Pie - sweet potato and bulleit bourbon filling in a homemade pie crust, topped with bruleed meringue. Breakfast Bur-roti - housemade roti flatbread folded over two eggs over-easy, cheddar cheese, and roasted peppers and onions. Topped with avocado black bean salad, quajillo chili sauce, and sour cream. Sausage Bahn Mi - housemade ginger-scallion sausage, red cabbage slaw, sweet & sour cucumbers, grilled scallion, cilantro, and sriracha mayo on a hoagie-style roll. Butternut & Blue Salad - roasted butternut squash, buttermilk blue cheese, walnuts, apples, fried parsnips, and sherry vinaigrette. Added roasted chicken for an extra cost. Meat & Potatoes Stack - bacon-wrapped meatloaf with mashed potatoes, roasted crimini mushrooms and spinach ragout, BBQ bacon-brandy sauce, a homemade biscuit, and thick-cut tempura onion rings. The Daily Egg - changes daily but always vegetarian. Can be prepared as an omelet or scrambler. This one is made with roasted butternut squash, onion, roasted peppers and asiago cheese. Espresso Cheesecake - housemade with Colectivo Coffee espresso and dusted with cocoa powder, served in a chocolate graham cracker crust. Chilaquiles - corn tortilla chips topped with braised chicken, quajillo chili sauce, queso fresco, avocado, jalapeño, cilantro, radish, and two eggs over-easy. Farmer's Hash - roasted sweet potatoes, brussels sprouts and parsnips sautéed with onion and rosemary and topped with two eggs. Served with toast. Lemon Ricotta Pancakes - topped with blueberries and sweet whipped ricotta. Savory French Toast - sourdough bread dipped in a parmesan cheese-herb batter and topped with crispy bacon, baby arugula, grilled onions, a sunny side up egg, and a drizzle of hollandaise. Dessert Special - double chocolate cake with a strawberry filling. Egg Benedicto - two poached eggs on a toasted English muffin with roasted tomatoes, Italian salsa verde, sun-dried tomato hollandaise, and crunchy candied prosciutto. Ramen Upgrade - RP's Pasta ramen noodles, grilled shrimp, homemade ginger-scallion sausage, green onion, radish, soft-boiled egg, ramen broth, chili-garlic oil and togarashi. Chicken & a Biscuit - fried white meat chicken topped with a sunny side up egg and served with a homemade biscuit, sweet corn-sausage gravy, and an apple-bacon salad. Corned Beef Hash - housemade corned beef, yukon gold potatoes, bell peppers and onion, topped with two eggs. Served with toast. Nana's Red Velvet - three layer red velvet cake with buttercream roasting and toasted walnuts. Shrimp & Grits - parmesan white corn grits, sautéed Texas Gulf shrimp. garlicky tomato sauce, and green onions. Topped with a sunny side up egg.